New HealthFare eatery is a fresh to go and health to stay restaurant franchise. The first HeathFare Restaurant in BC is opened its doors on Marine Drive @ Marine Way Market Crossing in Burnaby on February 28th 2013. HealthFare is 100% guilt free eating. All you need to do is show up and eat as there are no ‘bad’ choices on the menu. This eat-in or take-out restaurant’s menu features calorie marked items in addition to gluten free options that have been designed in a collaboration between chefs and dieticians. You get delicious food, prepared in only minutes at an affordable price. This exciting eco-friendly fast casual restaurant franchise is an education in the healthy concept franchise operation. HealthFare offers – all natural smoothies fresh rice bowls, non-processed meat sandwiches, salads and wraps and many vegan and vegetarian offerings. Customers will also find Vega health nutritional supplements and specialty bottled beverages such as all natural coconut water and fruit infused waters at their local HealthFare. But the goodness doesn’t end there: every HealthFare restaurant is designed with sustainability in mind. The restaurant is complete with BMW-designed all-recycled material chairs, décor pieces made from reclaimed wood, Japanese kirei board 100% recycled wood ceilings and marmoleum flooring made with natural and renewable ingredients. 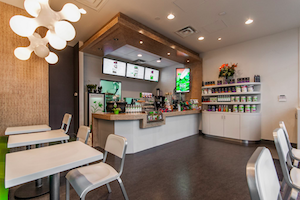 HealthFare’s green and eco-chic store design complements its healthy menu. HealthFare Marine Drive is open open 7am-9pm Monday to Friday and 8am-8pm Saturdays and Sundays 9am to 8pm. To find out more aboutHealthFare and to have a look at their menu, check out their website: www.healthfare.ca and follow them on twitter @HealthFareMrn.